Trinity Church, Boston, was completed in 1877. Its architect was H. H. Richardson, and numerous artists and craftspeople contributed to the interior design. In 1971, Trinity was designated a National Historic Landmark for "possessing "exceptional value in commemorating or illustrating the history of the United States." 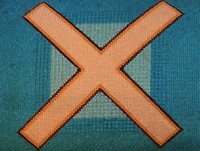 This kneeling stool needlework cover from Trinity Church, Boston, is designed with the X cross, or the cross of the disciple Andrew. Although not in the biblical text, Christian tradition recorded Andrew's death as being a crucifixion on the cross in an X position, since he did not want to be crucified in the same position as Jesus had been, a position that was considered holy. Trinity Church, Boston - Petrine cross, from Art in the Christian Tradition, a project of the Vanderbilt Divinity Library, Nashville, TN. http://diglib.library.vanderbilt.edu/act-imagelink.pl?RC=51524 [retrieved April 20, 2019]. Original source: Collection of Anne Richardson Womack.